Etihad is an airline that gets a lot of attention these days. Although they are struggling financially, they are known for their outstanding premium cabin products. As one of the few carriers that fly directly from the U.S. to the Middle East, Etihad Airways has plenty to offer to American travelers. Etihad Airways is not a member of any major alliance, but rather partners with several airlines and operates their own frequent flyer program, known as Etihad Guest. Etihad’s home airport is located in the capital of the United Arab Emirates, Abu Dhabi. As you will find out in this guide, all these routes operated are to Abu Dhabi (AUH). The United Arab Emirates is a fantastic tourist and business destination — Dubai is known as the financial hub of the Middle East, and Abu Dhabi is known for their mosques and Emirati culture. With so many travelers interested in visiting the Middle East and getting there in fashion, we want to give you all the routes and different products that Etihad Airways can offer for your trip to the United Arab Emirates. As we will get into later, there are huge variations between the seats across the different aircraft; that’s why it’s so important to understand which plane to fly! That way, you’ll have access to the best product you can get your hands on. Below is a summary of all the Etihad Airways routes to the U.S., along with the aircraft and cabin class. The last column describes the frequency, which is always subject to change — especially since Etihad is now cutting routes frequently to cut costs. As you can see, there are only 4 flights that Etihad Airways operates, so there’s not a ton of flexibility to be had if you want to fly on Etihad. Still, there are tons of different seats you can fly, so let’s get into the analysis! Etihad is not in any airline alliances; instead, they partner with several airlines. Using American Airlines miles is probably going to be your best bet. It’ll cost 115,000 AA miles for one-way flights in first class from the United States to the Middle East. The same ticket in business class costs only 70,000 AA miles! If you want the cheapest award, Asiana miles can’t be beat in this case. They only charge 80,000 miles one-way in first class and 60,000 miles one-way in business class. There’s a lot of other ways to use Asiana miles for maximum value if this isn’t your cup of tea. You may choose to book Etihad flights with their own program, Etihad Guest. It’s going to cost more miles and points, but it is a transfer partner with American Express Membership Rewards and Citi ThankYou Rewards. The last option would likely be with redeeming Korean Air SKYPASS miles if you’ve exhausted everything else. The Etihad Residence is flown on only 4 routes worldwide, one of which is the Abu Dhabi (AUH) – New York City (JFK) route! Of course, the Etihad Residence is offered only on the A380, which Etihad has 10 of. This Etihad Residence is arguably the most extravagant experience you can ever have on a commercial airline. You will have a total of 3 private rooms: a double bedroom, a private shower suite, and your living room (aka your main seat). You’ll also enjoy the services of a private butler and pretty much anything you want, including pre-customized meals. Etihad A380 Residence seat map. Image courtesy of seatguru.com. Sound and look ridiculous? Well, it is. 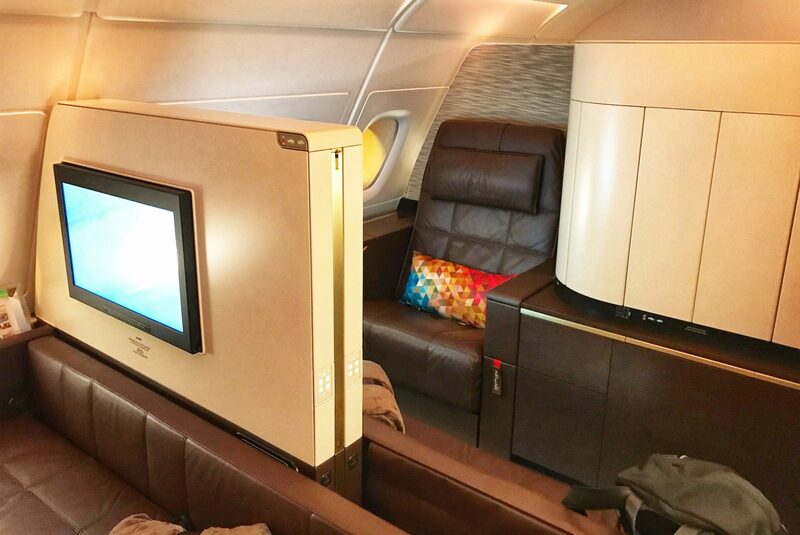 If you’ve got your mind set on flying the Etihad Residence, you’ll be happy to know that you can actually redeem points and miles to fly this product — and it has tons of award availability! The bad news? It’s going to cost you around 2,000,000 (yes, that’s 2 million) points one-way to book the Etihad Residence from New York to Abu Dhabi. But I mean, it might be a good deal if you consider the fact that cash tickets can cost $30,000-$40,000 one-way! The Apartments on Etihad’s A380 are almost second to none. Image courtesy of Upgraded Points. The Etihad First Class Apartments are a step down from the Etihad Residence, and are also flown exclusively on the A380 — so you can only fly First Class Apartments to/from New York City (JFK) and Abu Dhabi (AUH). But honestly…a step down from literally the best experience you can have on an airplane is still lots of steps above most other first class products! You’ll have an armchair as well as a separate bed (that you can transform into a double bed if you’re traveling with a companion). Let’s see what the seat map looks like! Etihad A380 First Class Apartments seat map. Image courtesy of seatguru.com. 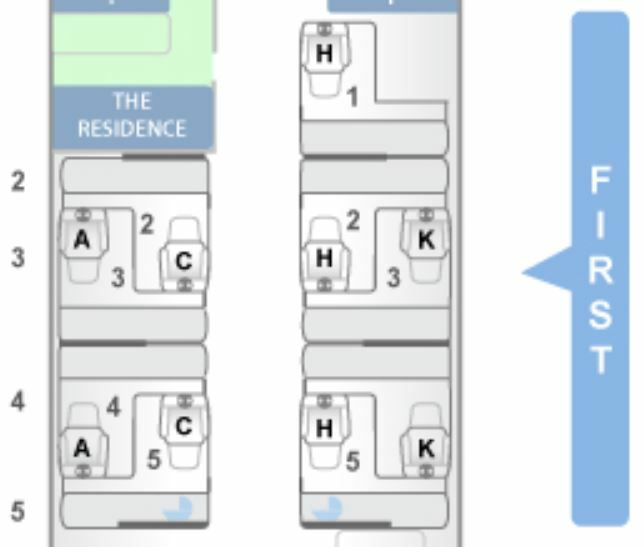 There is a total of 9 First Class Apartments, and the A/C and H/K seat pairs are connected (useful information for couples traveling together). The first class seat is 29.5″ wide and the bed is 80″ long — that’s a full 7’8″ of sleeping space! Let’s be honest here…it’s not like you’re gonna need any more space when flying the Etihad First Class Apartments, but the figures might be useful for comparison purposes. Hot Tip: Check out our guide to find out the best ways to book the Etihad First Class Apartments! Though not as spacious as the Etihad First Class Apartments, you can still enjoy a luxury experience in the Etihad First Class Suite. So far, the key differentiators between first class products have been the space you get. 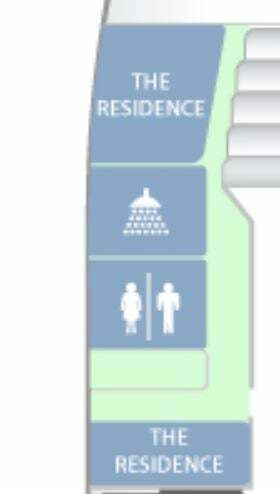 The Etihad Residence gets you 3 of your own private rooms, including a private shower, while the First Class Apartments only get you a giant armchair and a separate bed. With the Etihad First Class Suites, you’ll have a large seat and sliding doors that enclose your suite — but the seat will also be your bed. Etihad 777 First Class Suites seat map. Image courtesy of seatguru.com. First, let’s first talk about the 777’s first class. These suites measure up at 29.5″ in width and 80″ in length — pretty similar to the First Class Apartments, only you don’t get a separate bed. Since the 777 first class is an older product than the 787, it’s a lot less glamorous and therefore is in lower demand than the 787 first class. But we can use this to our advantage when searching for award availability, which tends to be better on the 777 than award availability on the 787. Now, let’s pivot over the 787 First Class Suites. Etihad is one of the very few airlines that offer first class on the 787 Dreamliner, so major props to them for making that move. The 787 Dreamliner utilizes better composite materials in their aircraft construction, resulting in a more comfortable aircraft with a much friendlier carbon footprint. Etihad 787 First Class Suites seat map. Image courtesy of seatguru.com. As you can see, the middle seats are actually facing opposite directions, which is quite interesting! Sadly, these 787 first class suites are smaller than the 777 first class suites. The 787 is 26″ wide, which is 3.5″ narrower than the 777. The pitch and bed length measure the same as the 777 (80″ long). Unfortunately, a 3.5″ difference in seat width is going to be very noticeable. But it makes sense, since the 787 Dreamliner is a smaller aircraft than the 777 (yet there are the same number of First Class Suites). Bottom Line: As someone who values seat size tremendously, the 777’s First Class Suites win out in this case. With the 777, you’ll enjoy more award availability and a larger seat size. You’ll give up aircraft technology, but it’s not as important to me if I get to fly on a more efficient aircraft. 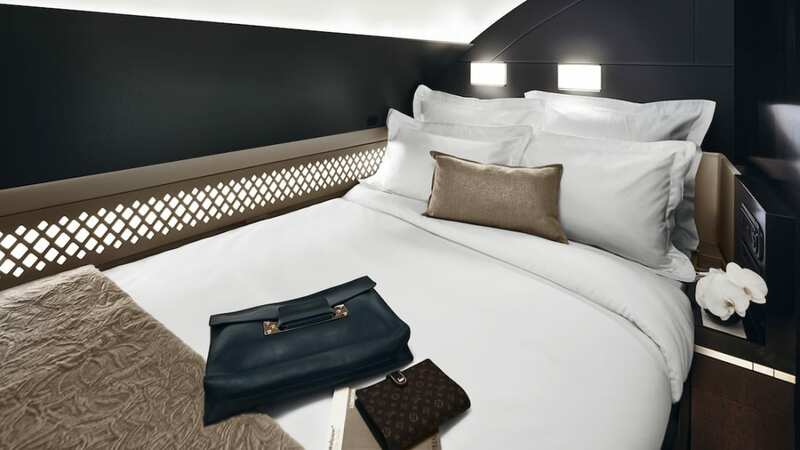 Relax in your lie-flat Business Studio on Etihad 787s and A380s. Image courtesy of airlinereporter.com. Etihad offers 2 different business class products: the Business Studio and Business Class. As you can probably guess, the Business Studio is the more respected and newer product. As you can imagine, we’re going to see that there’s a clear winner between the 2 in terms of Business Studio differences. Etihad 787 Business Class Studio seat map. Image courtesy of seatguru.com. The Etihad Business Studio is configured in 2 separate mini-cabins, with the front cabin being the most private. The front mini-cabin has 8 seats spread out across 2 rows in a 1-2-1 configuration, while the rear mini-cabin features 5 rows in the same 1-2-1 configuration — for a total Business Studio cabin size of 28 seats on the 787. The 787 Business Studio is 22″ wide and 73″ long, which is pretty sizable as a seat (this will be important for our comparison). Meanwhile, the A380 is a gigantic aircraft; as such, one can expect more Business Studio seats. In fact, there are a lot more: 72 seats total, spread out in a 1-2-1 configuration as well. The A380’s Business Studio cabin is separated into 3 mini-cabins, with 42 seats in the front, 24 seats in the middle, and 6 seats in the back. 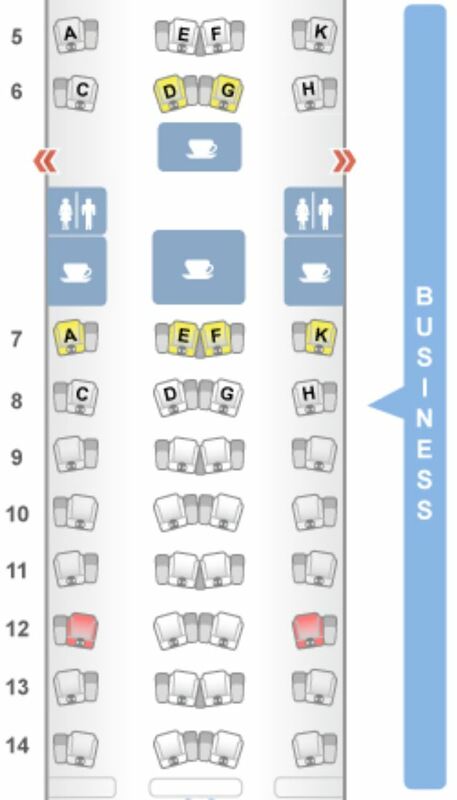 Etihad A380 Business Studio seat map. Image courtesy of seatguru.com. On the A380, these Business Studio seats are 20″ wide and 73″ long, which is 2″ narrower than the Business Studio on the 787 Dreamliner. Overall, the A380’s Business Studio is inferior to the 787 Dreamliner’s Business Studio because it has narrower seats and a larger cabin, which can contribute to the lack of intimacy. The best seats on the 787 Dreamliner Business Studio Cabin are 11A/K and 5D/G (especially for couples). 11A/K are all the way in the back, and there are no lavatories or galleys behind, so you’ll experience the least foot traffic. 5D/G is great because it’s a middle seat of seats, which is ideal for couples. You won’t be bothered because the galley isn’t near — the only problem is that these are rear-facing seats, which are 5 inches shorter in length. Aboard the A380, our best advice for seat selection is to pick forward facing seats. These seats are 5 inches longer in bed mode than the rear-facing seats. The mini-cabin of 6 seats furthest back is technically the most private, but the galley is super close, so it might be noisier. Perhaps the best options on the A380 are seats 10A/K because they’re not too close to the inflight lounge but are very far from lavatories and galleys! Bottom Line: Pick the 787 Business Studios when you can — they’re wider and there are fewer seats on the 787 compared to the A380. The seats themselves are much newer than those on the A380. Flying on Etihad’s Business Class is phenomenal. Image courtesy of Upgraded Points. 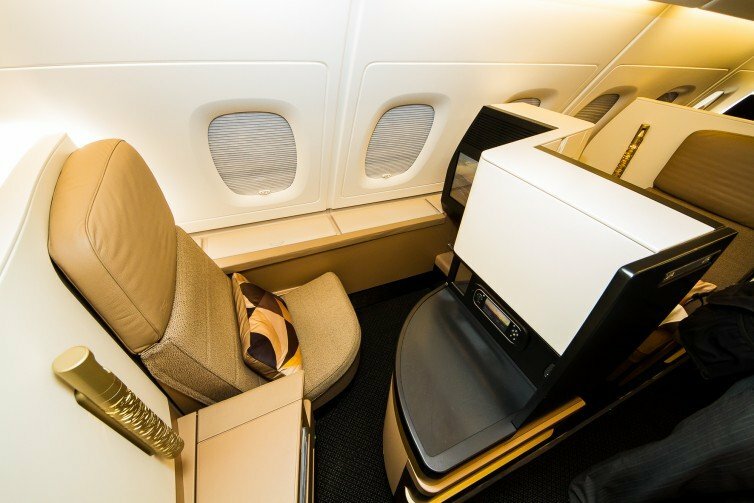 Etihad offers ordinary business class seats on their 777, which are all forward facing with a 20″ width and 73″ pitch/bed length. 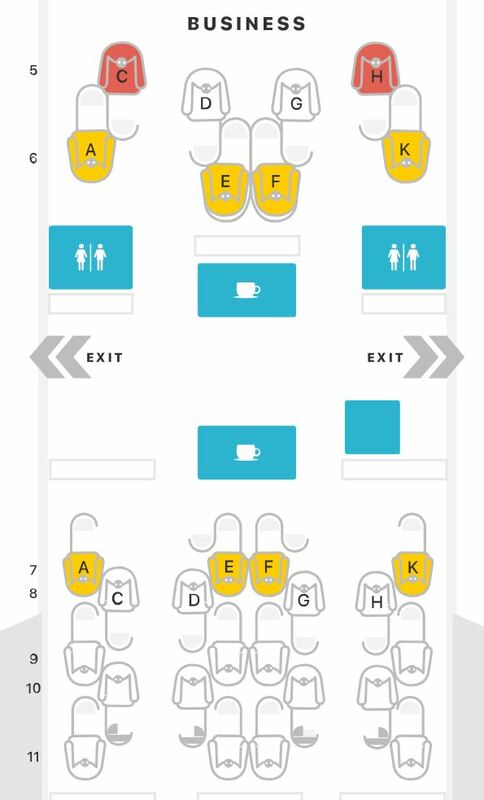 Etihad 777 Business Class seat map. Image courtesy of seatguru.com. 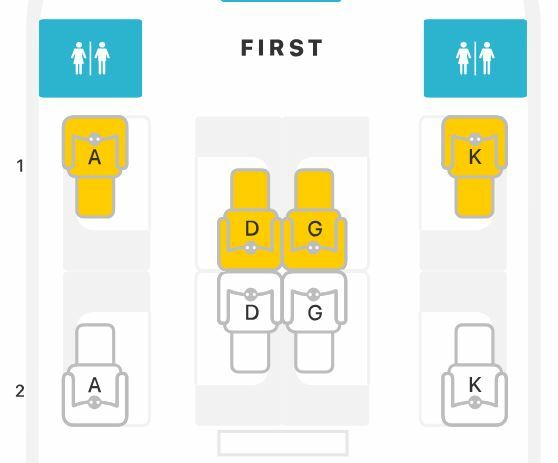 The odd rows are best for window seats and honeymoon seats (where you’re sitting right next to your seatmate/companion). General consensus is to avoid the even window seats, as they are close to the aisle. The best seats, in our opinion, would be seats in row 5; you will never experience foot traffic, as everything else is behind you! Hot Tip: Need help booking your Etihad Business Class flights? Check out our in-depth guide on the best ways to book Etihad Business Class. Etihad doesn’t offer premium economy seats on their flights to/from America. The Etihad economy seat has some differences across aircraft, believe it or not! Image courtesy of traveller.com.au. The last discussion we’ll be having is around the economy class seats. Etihad Airways brands their economy seats as “Coral Economy,” and this class is offered on all 3 of their aircraft: the A380, 777, and 787. Etihad economy seats on the A380 are very interesting, with clear winners and losers depending on which seat you get. The A380 and 777 both measure 17.5″ wide and 31″ long, while the 787 measures 17.2″ wide and 31″-32″ long. Generally speaking, you don’t want to fly economy on the 787 because it’s arranged in rows of 3-3-3 with basically no preferential seats; that is, no seats are better than any others. Etihad 787 economy class seat map. Image courtesy of seatguru.com. As you can see, there are no “extra good” seats in the 787. You’ll notice these seats are in a 3-4-3 configuration for the most part, with the exception being rows 41-45. Rows 41-45 only have 2 seats each, meaning that you could have more privacy or more space. Additionally, row 15 is a bulkhead seat that’ll afford you more legroom and also less foot traffic. For this reason, we would suggest taking row 15 seats, followed by A/C and H/K seats in rows 41-44 (especially if you’re flying with a partner). As you can see, the mostly 3-4-3 configuration is quite packed, so you want a seat that’ll let you sprawl out as much as possible. All seats, regardless of aircraft, are more or less the same seat size. The 787 has very few preferable seats, while the A380 and 777 have quite a few optimal seats. If you have the choice, you’d want to get on the A380, just because it’s a marvel to look at and fly on as the biggest commercial airliner. All in all, it will probably boil down to which airport is most convenient for you. Whew! 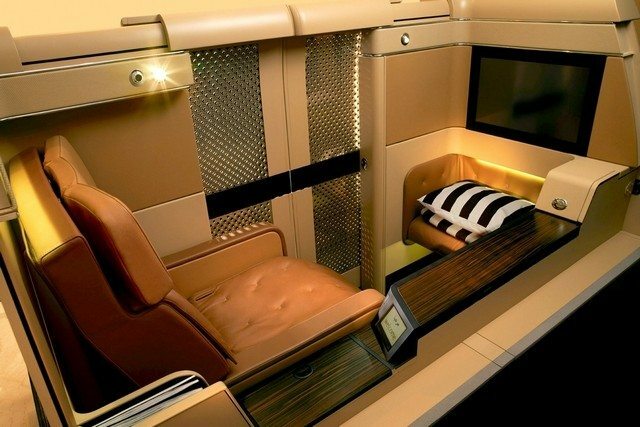 Etihad has a well-deserved reputation for flying some of the craziest premium cabin products ever. Hopefully now you have a better idea of the Etihad Airways routes to the U.S., along with the different seat options for every flight! What are the best ways to book Etihad Airways first class? Asiana Airlines offers the best award prices, but they only have 1 transfer partner: Marriott. It will cost 80,000 Asiana miles one-way for a first class flight to the Middle East from the U.S.
Alternatively, you can use 115,000 American Airlines miles, 105,000 Korean Air miles, or from 110,000-140,000 Etihad Guest miles to book. 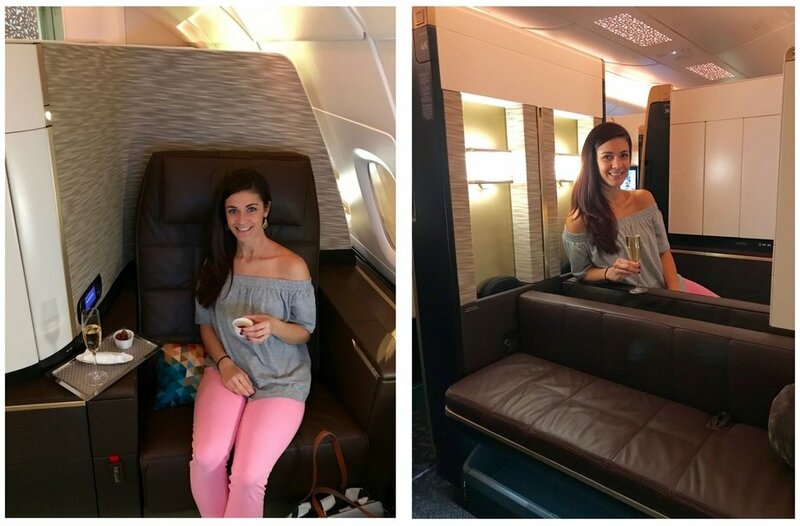 Check out our guide on the best ways to book Etihad First Class! 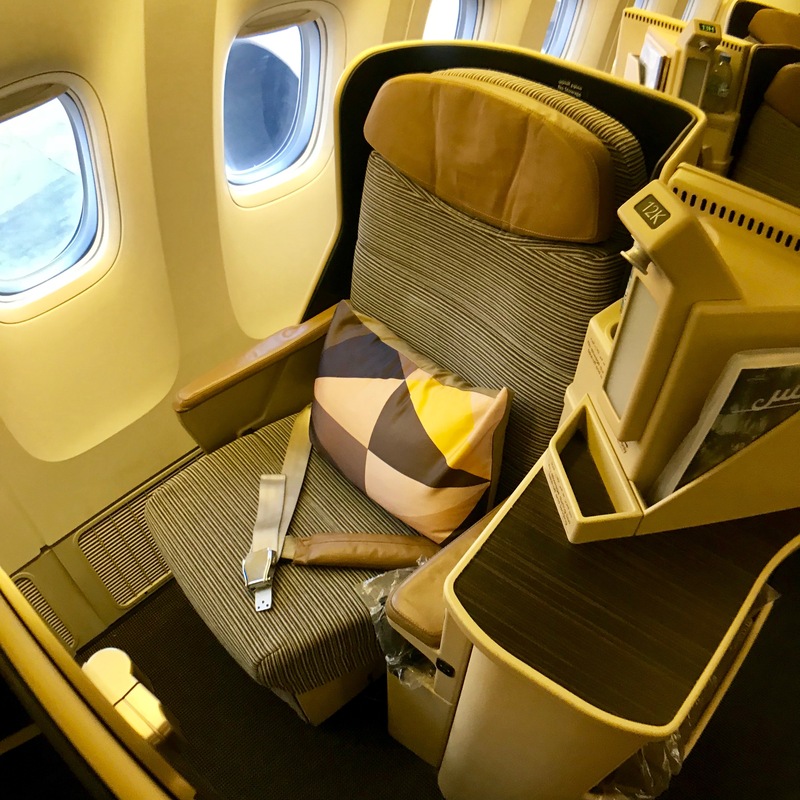 What are the best ways to book Etihad Airways business class? Asiana still offers the most competitive rates for business class: 60,000 miles one-way to/from the U.S. and the Middle East. American Airlines and Korean Air both charge 70,000 miles one-way, while Etihad Guest charges around 100,000 miles one-way. Check out our guide on the best ways to book Etihad Business Class! 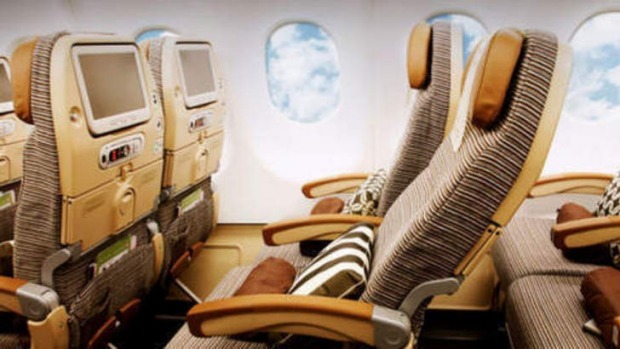 What are the best ways to book Etihad Airways premium economy class? Unfortunately, Etihad Airways doesn’t actually offer a premium economy seat for any of these routes. What are the best ways to book Etihad Airways Economy Class? In this case, both Asiana and American Airlines charge 40,000 miles one-way for any of the U.S./Middle East routes. However, the best is using Korean Air to book round-trip economy for 70,000 miles! However, you’ll need to book round-trips with Korean Air miles. Another alternative is Etihad Guest, which charges 57,749 miles for the Chicago route, 62,500 miles for the Los Angeles route, 57,751 miles for the New York City route, and 57,752 miles for the Washington, D.C. route. These are all one-way prices.